Thank you for visiting our related projects page. This page will be updated with similar and complimentary projects throughout the duration of the MErCuRIC project. COLOSSUS is an EU-funded H2020 project that aims to provide new and more effective ways to classify patients with a difficult-to-treat subtype of metastatic colorectal cancer (microsatellite stable RAS mutant metastatic colorectal cancer or MSS RAS mt mCRC) and to develop new treatment options for them. Our ultimate goal is to deliver a personalised medicine approach for patients with MSS RAS mt mCRC that is currently not available. The eSMART project is a pioneering research project that could transform cancer care and significantly reduce healthcare costs by enabling cancer care clinicians to monitor patients undergoing chemotherapy treatment for breast, bowel and blood cancers via mobile phone. The PrECISE project is a pilot project that combines hypothesis-driven strategies with data-driven analysis in a novel mathematical and computational methodology for the integration of genomic, epigenetic, transcriptomic, proteomic, and clinical data with the goal of risk-stratifying patients and suggesting personalized therapeutic interventions. In ANGIOPREDICT, academic cancer biologists and industry-based biotechnology researchers will work together with clinicians to identify biomarkers to predict whether individual metastatic colorectal cancer patients will respond positively to Avastin® combination therapy. AngioPredict involves MErCuRIC partners RCSI and Pintail. Pierre Laurent-Puig of PDUM is the director of this cancer research centre dedicated to cancer research in personalised medicine. 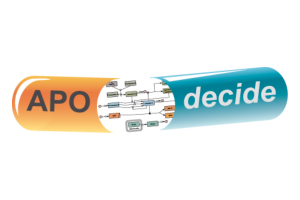 The APO-DECIDE consortium will tackle the problem of chemotherapy resistance in colorectal cancer. Is it possible to predict the likelihood of subsequent complications following childhood cancer treatment on the basis of genetic tests? This is the main question to be addressed by an EU-wide research project that is being coordinated by the German Childhood Cancer Registry at the Institute of Medical Biostatistics, Epidemiology, and Informatics (IMBEI) of the Mainz University Medical Center.